If you have any questions regarding our procedures, please contact us today. For the convenience of our out-of-town patients, we are happy to provide a ‘virtual consultation’. We’ll gladly examine any high-resolution pictures you have to advise you on your beautification options. Just send us a message below and we will respond to you with instructions on submitting your pictures. 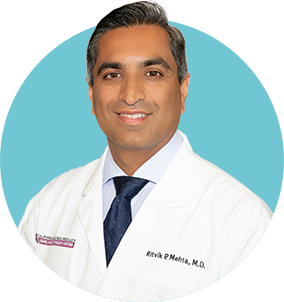 Dr. Mehta – Facial Plastic Surgeon – Dr. Mehta received his medical degree from the UCSD School of Medicine. He then went on to Harvard Medical School where he completed his internship in General Surgery and residency in Otolaryngology / Head and Neck Surgery. Learn more about Dr. Mehta.